125 Schools, Lake Grove, class photos. Mrs. Hargreaves. 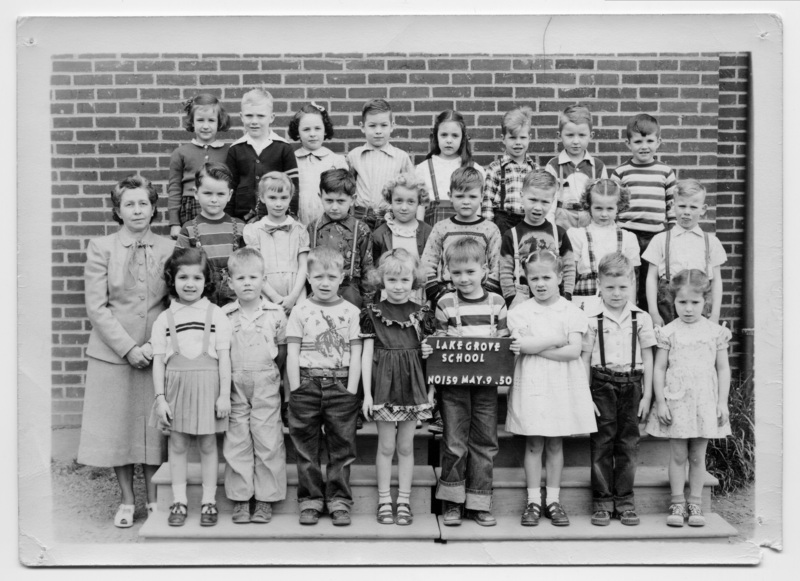 1st Row: Lynda Stevenson, Thurman Failey, Dean Martin, Ann Lawrence, Stevie Nelson, Sarah Allender, Roger Hutson, Connie Keller. 2nd row: Richard Morris, Carol Hall, Dean Strauderman, Diane Spring, Roger Knight, Jim Burke, Terry Anne Collor, Jerry Wright. 3rd: Shirley Lehner, Walter Barnes, Carol Rolf, Alan Robertson, Janet Roberts, Keith Abrams, Billie Dur, Erwin Dahlke. [stamp]: Mr. & Mrs. J.B. McNeil, Commercial Photographers, 8623 S.E. 11th Ave., Portland 2, Oregon. Description Scanned as B & W; corner torn, pinholes, folds. Teacher is Clara Hargreaves; sign held by student: Lake Grove School, No. 159; May.9.50. Transcription 125 Schools, Lake Grove, class photos. Mrs. Hargreaves. 1st Row: Lynda Stevenson, Thurman Failey, Dean Martin, Ann Lawrence, Stevie Nelson, Sarah Allender, Roger Hutson, Connie Keller. 2nd row: Richard Morris, Carol Hall, Dean Strauderman, Diane Spring, Roger Knight, Jim Burke, Terry Anne Collor, Jerry Wright. 3rd: Shirley Lehner, Walter Barnes, Carol Rolf, Alan Robertson, Janet Roberts, Keith Abrams, Billie Dur, Erwin Dahlke. [stamp]: Mr. & Mrs. J.B. McNeil, Commercial Photographers, 8623 S.E. 11th Ave., Portland 2, Oregon.